The elements of the periodic table can be broken into three different groups: Metals, Metalloids, and Nonmetals. This periodic table shows the three different groups of elements. The metalloid group separates the metals from the nonmetals. 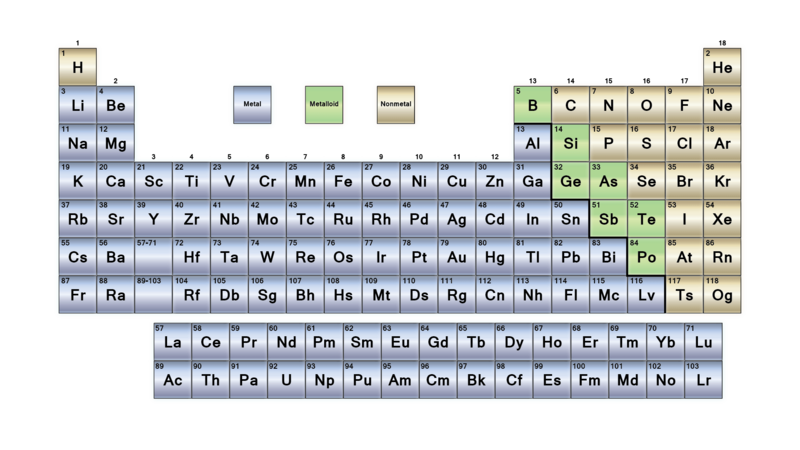 Elements to the left are metals and nonmetals are to the right. The exception is the element hydrogen. Hydrogen has properties of a nonmetal at normal temperatures and pressures and an alkali metal under extremely high pressure. Some periodic tables include a zig-zag line to distinguish between metals and metalloids. The line begins below boron (B) and extends between bismuth (Bi) and polonium (Po) or down between livermorium (Lv) and Tennessine (Ts). In reality, the metals near the line often display nonmetallic properties the nonmetals have some metallic character. but not hammered into sheets. Bismuth is entirely metallic in its chemical behavior. for Antimony 0.000042 ohm for Antimony–typical metallic values.